Mention castor oil and my mind flashes back to horrendous memories of being lined up as kids and force fed spoons of the vile stuff as a laxative that literally churned your innards with excruciating agony. Once free from that uniquely Asian mode of maternal torture, I vowed to never let a bottle darken my doorstep ever again. Not even if it was the world’s top all-in-one wonder remedy for everything, right from menstrual cramps to stretch marks. Not even if Ayurveda, Chinese, Persian, Egyptian, African, Greek, Roman, American medicine and modern science promise it as the cure-all miracle for almost everything. Not even if it caught Patrick Dempsey by hand and deposited him on my doorstep… we will not go there! And for the past 20 years that promise has worked well enough… till yesterday, when my personal detox guru Kimberly Snyder (of The Beauty Detox Solution and Drew Barrymore fame) started talking about castor oil packs. Now, Kimberley has completely changed my life around with her painless, effective and yet enjoyable route to detoxification. So, when she says you can reap the benefits of castor oil without suffering through its laxative side effects, I listen. And then I research. Extensive digging shows that castor oil packs actually date back thousands of years and have been recommended by both doctors and alternative health practitioners for a range of things, including liver problems, fluid retention, arthritis, infertility, PCOS, migraine, skin infections and chronic internal inflammation. Worth looking into, right? I think so too. But first, what exactly is castor oil? It’s a thick, viscous, transparent oil derived from the bean of the Ricinus communis (also known as Palma Christi, or ‘palm of God’) plant. Topically, castor oil works by drawing blood circulation and enhanced biological energy to the area where it is applied, then pulling lodged toxins out of the body. It also boosts lymphatic circulation, keeping every body cell properly cleansed of waste. Plus, it’s packed with rinoleic acid, which helps prevent the growth of numerous viruses, bacteria, yeasts and molds. The end result is increased circulation, decreased inflammation (both internal and external), elimination of toxins and healing of tissues and organs. Why does the castor oil pack go over your liver? Simple: because it’s our liver that keeps everything else clean and junk-free. It helps us digest fats, detoxes the blood, regulates hormones and stores energy. 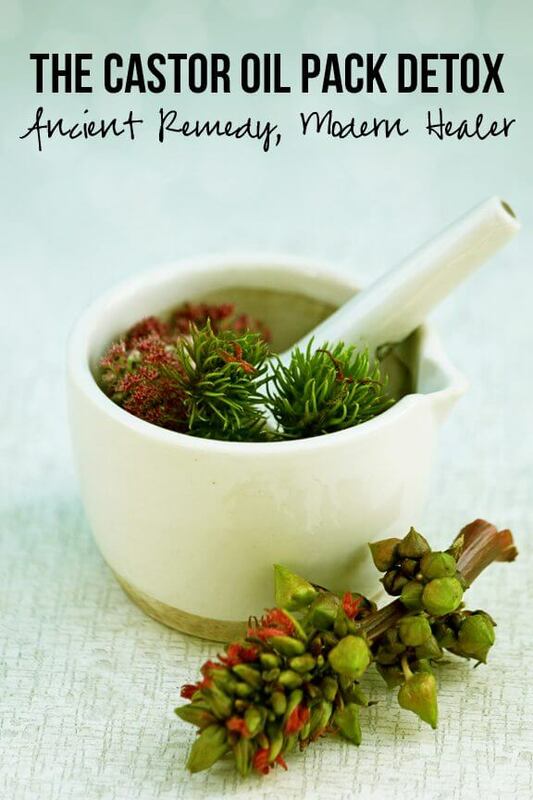 A castor oil pack allows the liver to relax, release its toxins and rejuvenate. The benefits? More balanced hormone and blood sugar levels, better digestion and an improved immune system. Oh… and you might just find yourself less grumpy after a castor oil pack detox as the liver also stores repressed anger. Phew! And now… how to do a castor oil pack detox! Method 1: Fold an old flannel cloth into 3 layers to fit over your entire abdomen. Then soak the cloth in warm castor oil, lie down and drape it over your abdomen. Layer an old towel over the oil soaked fabric and place a heating pad or hot water bottle on top. Leave the pack on for 45-60 minutes, then wash off the oil with soap and water. Method 2: Rub generous amounts of warm castor oil directly onto your abdomen, then bind everything with a plastic sheet (saran wrap works brilliantly!). Layer an old towel over the plastic wrap and place a heating pad or hot water bottle on top. Leave the pack on for 45-60 minutes, then wash off the oil with soap and water. 1. Always wash well after removing the castor oil pack. This helps clear away the acidic toxins that have been drawn out of the body during the treatment. 2. It’s not ideal to do the castor oil pack detox after a heavy meal; allow at least an hour’s buffer time. 3. For maximum effectiveness, apply the castor oil pack twice a week. 4. Whenever possible, opt for cold pressed castor oil as it’s most potent. 5. And as always, consult with your doctor if there are any contraindications. Those who have cancer, are pregnant, breast-feeding, or menstruating need to be particularly careful! Have you ever tried a castor oil pack? Did you notice its benefits? I would love to hear your experiences. « Is rice water Asia’s best kept beauty secret?